The 22" e2260Swdn is a slim monitor that offers substantially lower power consumption than traditional monitors. This Eco-friendly monitor is both ENERGY STAR and EPEAT Silver certified. The 22" e2260Swdn is a slim monitor with clean styling - its hair-line texture finish provides a luxury look and feel. Along with being both ENERGY STAR and EPEAT Silver certified for its green packaging and production, the display's LED backlight is completely free of toxic Mercury. The monitor is also equipped with multiple power-saving features for reduced environmental impact. The display comes with both a (15-pin) D-sub male and (24-pin) DVI-D with HDCP connector and a maximum resolution of 1920 x 1080. 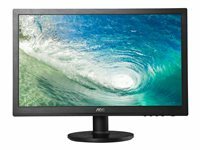 The monitor offers remarkable image quality with a 16:9 aspect ratio and an impressive 20,000,000:1 contrast ratio, revealing darker image areas in greater depth. The e2260Swdn boasts a 5 ms response time to eliminate drag - watch your favorite videos or play games without missing a beat! The e2260Swdn is VESA wall mount compliant, features a Kensington security slot, and a user-friendly graphical OSD menu.